Click here to create fun and energy! All of our entertainers perform with razor sharp detail, are well spoken and we will always keep you and your guests involved throughout the event!! Click here to discover our Photography Collections! We incorporate both traditional and photo-journalistic styles throughout your day… We will be motivated and move around your event, so we will always be there when it happens! Click here to view our Digital Videography Services! Have your memories captured forever by a Professional Videographer!! From your ceremony to your reception, including all interviews, special effects and editing! Click here to find additional services to accent your event! From Up-Lighting to Photo-Booths, Custom Projections, Video Screens and everything between! Throughout your visit, we will explain how Sound City can help your event become more than you ever imagined! We always listen to your ideas, your needs and most importantly YOU! Sound City Entertainment now offers Drone Services for our Photography and Videography! "Hi Bill, We just wanted to thank you so much again! Everyone had an amazing time. My legs are killing me today from all the dancing. We’ve received so many compliments from our guests to say how much they loved you! Even people that don’t normally dance were out on the floor. Thank you so so so much again!!" "I hope the fall is going well for you both! AJ and I just attended my cousin’s wedding this past weekend in NY, and to be honest I felt a little bad because everyone kept comparing it to our wedding, and let me tell you, there was no comparison! I’m still amazed by how wonderful everything was, and by how instrumental you both were in making the whole day an absolute dream!" "Dawn and Bill, We just wanted to send you a quick thank you note for everything you and your team did for our wedding! It was the most perfect day, couldn’t have asked for anything more." "Hi Bill and Dawn, I hope that all is well with you both. First, I just want to say thank you from the bottom of my heart for the amazing service we received on our wedding day from Sound City. We were so pleased with the Photography, Videography and of course, the DJ! 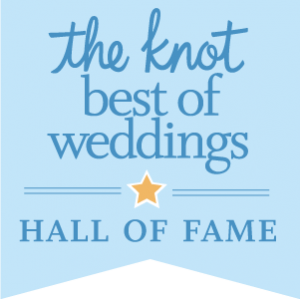 We received so many compliments and have already been referring you to some people we know getting married"
Click Below to see our reviews on The Knot!! Sound City Entertainment is proud to be certified by the National Wedding Council. They only certify only the TOP 4% of all wedding vendors in the US! Please click the logo above to find out more! There is no room for compromise when it comes to personal service and quality… Our personal service always shows in the way we treat all of our clients, and the events in which we are a part of!! We actively participate within our professional communities to educate and learn the latest trends and styles to keep our events current! We believe experience is more than just repeating the same performances and styles over and over each time! We offer multiple services including: fun, interactive Disc Jockeys, creative Photography, digital Videography and Event Services. We are a family owned and operated business and Sound City Entertainment has been entertaining all types of events for over 25 years. We have an award winning professional staff, top of the line equipment, and always friendly and fun personalities!! We also offer incredible Lighting options, Event Production, Pipe and Drape, Flat Screen Monitors and Photo-Booths! Sound City Entertainment is also on the Board of Directors for the New England Chapter of the National Association of Catering and Events!